This month we're asking everyone to MELT IT! Get out the UTEE (ultra thick embossing enamel), beeswax, encaustic wax, embossing powders or good old wax crayons and a heat tool and get melting to create something in a vintage; shabby; mixed media; art journalling; industrial, timeworn or steampunk style! I had the pleasure of attending Creativation in Phoenix, Arizona this year and I attended a couple of classes with Seth Apter and watched his many demos with his new Baked Textures Embossing Powders by Kim Evans of Emerald Creek - they are fantastic! This fitted so well into Julia's theme too! I didn't take step by step photos as I did this at nightime and really, I was just playing. Seth used a collage of vintage papers in his demos, I used some beautiful vintage music paper for mine, gluing it to a 5" x 7" piece of grey board and leaving it to dry thoroughly. Now for the fun bit! I applied three coats of the gorgeous Vintage Beeswax Baked Texture embossing powder - it is truly amazing how much this looks like Encaustic work, I almost didn't want to cover it up! Next, I applied embossing ink randomly around the edges and then applied Rocky Road Baked Texture, it has a wonderful chunky feel to it, with a lovely mix of ingredients and it dries to a quite glossy finish. Seth's Maze die is one of my favourites, I die cut two pieces and embossed the first one with Chunky Rust Baked Texture - this is so different to any other EP I have ever used, it has lots of 'fuzzy' bits in it and once melted, these fuzzy bits create a wonderful soft feel and gives a wonderful textural look. It is hard to describe but wonderful to feel! I cut down the second Maze and embossed this with the amazing Patina Oxide Baked Texture, the photograph does not do it justice, it has a wonderful mix of colours from green through to gold - it is quite delicious! It needed something in the centre so I found some rusty Prima trinkets and stacked them along with one of Kim Evans of Emerald Creek's fancy brads, which I also covered with the Patina Oxide EP. To finish off I used one of Tim Holtz Idea-ology drawer pulls, which I also coated with the Patina Oxide EP and added the chit chat sticker 'Grateful' because I have a lot to be grateful for this year already! who are offering a £20 voucher to one lucky winner! I want to be slightly indulgent here, to say that I am grateful to my Son, Michael who treated me to a very special trip of a lifetime, to Creativation 2018; to Eileen Hull for making me feel so welcome in the team, allowing me to demo for a couple of sessions on the Sizzix stand, on the Gel Press stand and assisting her to run two of her amazing classes - I learned so much too. And, not forgetting the shopping trip to Joann's! There were others on the team and elsewhere, who I had not met before that made me feel very special too, some dear long standing blog friends who invited me to dinner and unwittingly saved me from being 'Billy no-mates' in my hotel room that night. Thanks to Jenny Marples too, for assisting me on the trip there and back which sadly, was more than a little bit eventful - sorry Jenny! I am also grateful to the many people who gave me such wonderful products to bring home and try, it was like Christmas all over! Thank you Eileen, Seth Apter, Kim Evans, Ann Butler and so many others, I really did have an amazing time! 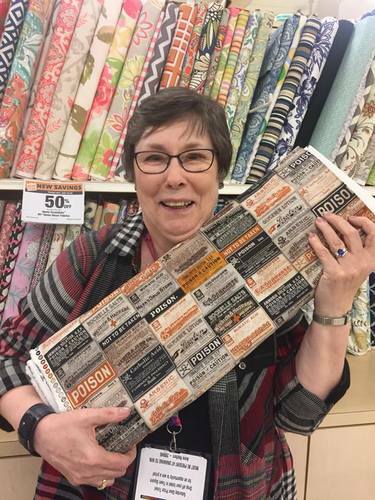 I didn't take many pictures at Creativation but this one taken by Eileen says it all about our trip to Joann's, I am excitedly clutching a bolt of Tim Holtz fabric.... and yes, I did buy (ahem) a few other bits and pieces! Thanks so much for your visit, it really does mean a lot! Wow, Anne, this is absolutely amazing!! The maze die looks so spectacular!! The rust and the patina are stunning!! The music background is fabulous and I love the edges!! It's so creative and gorgeous!! Love all that created texture Anne, reminds me of areas of my garden and how the damp wet areas have corroded areas over winter time. So glad you had a fabulous time at Creativation, what a wonderful Son. I did try and keep up with your antics whilst you were away. You really did look very contented with the whole experience. Wishing you a creative weekend. Oh my goodness. This is incredible Anne!! The baked texture around the edge looks amazing and I love that maze die .. it looks wonderful on top of that lovely music paper!! Beautiful creating!! WOW! This looks amazing, the texture looks fab and I love the die. Love your use of Seth's baked textures , Anne. Each one complementing and enhancing the other and all coming together to make for a fabulous piece of art . Great choice of die - one of my faves too :) . Great to see you loving your time at Creativation. The 'captured moment' has made me smile each time I have seen it- that bolt was made for you! PS LoVE that photo !!!!! Anne...this piece is beyond stunning! I am so jealous that you got to have classes with the amazing Seth. Isn't he just the best? I have not had the pleasure of trying out his new embossing things and I would LOVE to do so! I guess I'll just have to wait in line forever to get an order placed and filled. haha Your piece is breathtaking! I know Seth will love it! Oh Anne! I absolutely love that photo of you and the excitement on your face says it all!I am so happy for you that you were to come here, what a wonderful son you have!! And to experience Creativation first hand...I am so jealous- in a good way! I love what what you created her and you absolutely showcased Sth's new powders brilliantly! Oh you lucky, lucky lady!! Your piece here is absolutely wonderful, I can just see how much you enjoyed those classes with Seth, and wow, you have cerainly done those gorgeous powders justice! And good on you to be a bit indulgent, this is such a lovely photo!! And now ofcourse I can't wait to see what you will make with all those goodies! This is one incredible piece Anne. Love how you layered the two dies and used 2 different powders for such a great effect. Yowza! Anne, I could not wait to come and see this beautiful and textural artwork up close, but was waiting to comment when I had plenty of time. You know I get wordy! Firstly, this is the most heartwarming post! I loved reading about your experience with Seth's new powders and how you got to see his demos. (Squeal!) And reading about your other experiences (shopping trip! Eek!) and seeing you with that bolt of TH fabric just tickles me pink. (and green with envy!) Michael is such a generous and thoughtful son to send you on this trip of a lifetime! And Jenny is such a sweet friend to provide assistance on the trip! I'm so happy for YOU! Now onto this artwork! What a fabulous choice of background! The Beeswax BT looks to be quite the powder of the decade, and I'm sure it's going to be hard to keep in stock. (Sadly, it doesn't come in a larger size!) The other powders look amazing on the edge and die cuts. I cannot wait until mine arrive! Brilliant way to finish this piece off with the drawer pull sentiment and trinkets. Perfect in every way! Sending hugs! Utterly fabulous - wow! I've got Seth's powders en route to join me here in New York and I'm looking forward to playing with them even more after seeing this brilliant piece. Love the waxy music manuscript and amazing patinas on the die-cut pieces. Glorious! I haven't been able to see you on FB (won't let me see the link for some reason), but it sounds as though you had an absolutely brilliant time. Looking forward to hearing/seeing more once you can share it. Such a beautiful beautiful project Anne and Thank you for sharing about your trip...the crafting world is filled with loving , generous souls! Speaking of enabling, Anne....I think I am going to have to break down and buy some of Seth's new embossing things. They are just too cool to not have. YOU are the reason for this, my friend. This piece is just amazing! Wow Anne, this is just amazing!! The bees wax stuff really does look like an encaustic piece, what a fabulous effect and works so well with the vintage musical notes background. Your maze pieces are wonderful with all the rusted erosion techniques, and the Prima trinket element is fantastic! My favourite bit is the gilding effect around the outside, straight from a treasure chest for sure! Oh Anne - I am so sorry I am late to the party. This piece is extraordinary! You always seem to have the right stash to go with what you are making for that extra embellishment. I love that picture of you - you look like a kid in a candy factory. I know you were thrilled to find the TH fabric. Will have to look into some of those embossing powders.